The kinetics of IPSCs influence many neuronal processes, such as the frequencies of oscillations and the duration of shunting inhibition. The subunit composition of recombinant GABAA receptors (GABAARs) strongly affects the deactivation kinetics of GABA-evoked currents. However, for GABAergic synapses, the relationship between subunit composition and IPSC decay is less clear. Here we addressed this by combining whole-cell recordings of miniature IPSCs (mIPSCs) and quantitative immunolocalization of synaptic GABAAR subunits. In cerebellar stellate, thalamic relay, and main olfactory bulb (MOB) deep short-axon cells of Wistar rats, the only synaptic α subunit was α1, and zolpidem-sensitive mIPSCs had weighted decay time constants (τw) of 4–6 ms. Nucleus reticularis thalami neurons expressed only α3 as the synaptic α subunit and exhibited slow (τw = 28 ms), zolpidem-insensitive mIPSCs. By contrast, MOB external tufted cells contained two α subunit types (α1 and α3) at their synapses. Quantitative analysis of multiple immunolabeled images revealed small within-cell, but large between-cell, variability in synaptic α1/α3 ratios. This corresponded to large cell-to-cell variability in the decay (τw = 3–30 ms) and zolpidem sensitivity of mIPSCs. Currents evoked by rapid application of GABA to patches excised from HEK cells expressing different mixtures of α1 and α3 subunits displayed highly variable deactivation times that correlated with the α1/α3 cDNA ratio. Our results demonstrate that diversity in the decay of IPSCs can be generated by varying the expression of different GABAAR subunits that alone confer different decay kinetics, allowing the time course of inhibition to be tuned to individual cellular requirements. In most brain areas, inhibitory synapses are formed by local circuit GABAergic interneurons, a diverse population of cells that perform a multitude of functions, including the control of input summation and output generation (Klausberger and Somogyi, 2008). Interneurons generate IPSCs in their target cells by activating postsynaptic GABAA receptors (GABAARs) (Farrant and Kaila, 2007), which are also the site of action of numerous clinically relevant drugs. Most of these drugs act as positive allosteric modulators of the receptors, altering phasic inhibition mainly by prolonging the decay of IPSCs (Macdonald and Olsen, 1994; Rudolph and Mohler, 2006; Sieghart, 2006). Among central neurons the decay times of IPSCs show large variability; weighted decay times (τw) range from <2 ms (Bartos et al., 2001) to >100 ms (Zhang et al., 1997). However, the exact origins of this tremendous variability are unknown. Potentially, alterations in the spatiotemporal profile of the GABA concentration in the synaptic cleft or in the properties of postsynaptic GABAARs could underlie this variability. However, experiments in which GABA diffusion and clearance were altered showed either no (Perrais and Ropert, 2000; Overstreet and Westbrook, 2003) or relatively little (<30%) (Williams et al., 1998) effect on miniature IPSC (mIPSC) decay. Changing the intracellular concentration of chloride from 5 to 30 mm slowed IPSC decay by ∼60% (Houston et al., 2009). Changing the phosphorylation state of GABAARs or their association with anchoring protein complexes by blocking calcineurin (Jones and Westbrook, 1997) or protein phosphatase 1/2A (Nusser et al., 1999) activity had variable, but less than twofold, effects on the decay of IPSCs. Declustering of GABAARs accelerated the onset and reduced the amplitude and frequency but did not affect the decay kinetics of mIPSCs (Petrini et al., 2003; Marchionni et al., 2009). These experiments indicate that changes in the spatiotemporal profile of GABA in the synaptic cleft, the phosphorylation state of postsynaptic GABAARs, or the intracellular concentration of permeant ions have effects that are much smaller than the 50-fold variability in mIPSC decay times recorded from different central neurons. Both the recording temperature and the developmental stage of the animal have a strong influence on the decay of synaptic currents. However, when recorded under identical conditions, a more than fourfold variability in τw remained between different cell types (e.g., τw = 10–46 ms at 24°C) (Hájos et al., 2000) (τw = 3.2–14 ms at 34°C) (Nusser et al., 2001). An obvious source of this variation is the different subunit composition of postsynaptic GABAARs. It has been convincingly demonstrated that the subunit composition of recombinant GABAARs strongly affects the deactivation kinetics of GABA-evoked currents (Verdoorn et al., 1990; Macdonald and Olsen, 1994; Gingrich et al., 1995; Tia et al., 1996; Lavoie et al., 1997; Vicini, 1999; Bianchi et al., 2002; Picton and Fisher, 2007; Bright et al., 2011). However, because most central neurons express multiple subunit types (Fritschy and Mohler, 1995; Pirker et al., 2000; Wisden et al., 2002), many of which are present together in individual synapses, it is less clear how IPSC decay depends on the subunit composition of the GABAARs present. Here we investigate the effect of subunit composition on the τw by recording mIPSCs from different neuronal cell types in which the synaptic subunit content has been determined using high-resolution immunolocalization with subunit-specific antibodies. Male Wistar rats (age range, 21–32 d) were deeply anesthetized with either ketamine (8 mg/kg, i.p.) or isoflurane in accordance with the ethical guidelines of the Institute of Experimental Medicine Protection of Research Subjects Committee. Animals younger than postnatal day 21 were not used because GABAAR subunit isoform expression and synaptic current kinetics are known to be altered during postnatal development. After decapitation, the brain was removed and placed in ice-cold artificial CSF (ACSF) containing the following (in mm): 230 sucrose, 2.5 KCl, 25 glucose, 1.25 NaH2PO4, 24 NaHCO3, 4 MgCl2, and 0.5 CaCl2. Horizontal slices from the main olfactory bulb (MOB), parasagittal slices from the cerebellum, and coronal slices from the thalamus were cut at 300 μm thickness with a vibratome (VT1000S, Leica Microsystems) and were stored in ACSF containing the following (in mm): 126 NaCl, 2.5 KCl, 25 glucose, 1.25 NaH2PO4, 24 NaHCO3, 2 MgCl2, and 2 CaCl2. All extracellular solutions were bubbled continuously with 95% O2 and 5% CO2, resulting in a pH of 7.4. After a 30 min recovery period at 33°C, slices were further incubated at room temperature until they were transferred to the recording chamber. Slice electrophysiological recordings and data analysis. Somatic whole-cell recordings were performed at 26.6 ± 0.7°C using an oblique illumination technique on an Olympus BX51WI microscope with a 40× water-immersion objective. As synaptic current kinetics are steeply dependent on temperature, special care was taken to continuously monitor and maintain a consistent temperature during each recording session. Recordings were performed using a mixed K-gluconate- and KCl-based intracellular solution [containing the following (in mm): 65 K-gluconate, 70 KCl, 2.5 NaCl, 1.5 MgCl2, 0.025 EGTA, 10 HEPES, 2 Mg-ATP, 0.4 Mg-GTP, 10 creatinine phosphate, and 8 biocytin; pH 7.33; 270–290 mOsm]. Voltage-clamp recordings of mIPSCs at a holding potential of −70 mV were performed in the presence of 1 μm TTX (Alomone Labs) to block voltage-gated sodium channels and 3 mm kynurenic acid to inhibit ionotropic glutamate receptors. After establishing the whole-cell configuration and allowing for a 2 min stabilization period, an initial “baseline” period of 4 min was recorded for each cell. In a subset of cells, this was followed by the addition of 100 nm zolpidem to the bath solution. Following a 12 min period of drug equilibration, a second 4 min (“steady-state zolpidem”) period was recorded. An additional control group was recorded in the same way, except that instead of washing in zolpidem, the recording was performed in ACSF for a total of 22 min, in which the same two 4 min periods were analyzed (referred to as “baseline” and “steady-state control”). Recordings were performed with a MultiClamp 700A amplifier (Molecular Devices). Patch pipettes were pulled with a Universal Puller (Zeitz-Instrumente Vertriebs) from thick-walled borosilicate glass capillaries with an inner filament (1.5 mm outer diameter, 0.86 mm inner diameter; Sutter Instruments). Data were digitized on-line at 20 kHz and filtered at 3 kHz with a low-pass Bessel filter. Individual mIPSCs were detected and analyzed off-line with EVAN 1.5 (Nusser et al., 2001). Traces contaminated by the overlap of multiple synaptic currents in their rising or decaying phase were discarded. For most cell types, only mIPSCs with a 10–90% rise time of <500 μs were included in the analysis to minimize the effects of dendritic filtering on mIPSC kinetics. For external tufted cells and nucleus reticularis thalami neurons, a 10–90% rise time cutoff value of 1.5 ms was used, as recombinant α3 subunit-containing GABAARs exhibit fourfold slower activation kinetics than their α1 subunit-containing counterparts (Gingrich et al., 1995; Picton and Fisher, 2007). This 0.5 ms rise time subselection had very little effect on the mIPSC decay. In stellate/basket cells, the τw of mIPSCs with 10–90% rise time <0.5 ms (3.91 ± 0.58 ms) was virtually identical to that of mIPSCs with 10–90% rise time <1.5 ms (3.97 ± 0.55 ms). Similar to the decay kinetics in control, the τw in 100 nm zolpidem showed practically no difference regardless of whether we used 0.5 ms (6.75 ± 1.98 ms) or 1.5 ms (6.76 ± 1.88) rise time restrictions. For deep short-axon cells (dSACs), the τw of mIPSCs with a 10–90% rise time <1.5 ms (5.12 ± 1.06 ms) was only 3% slower than that of mIPSCs with a 10–90% rise time <0.5 ms (4.95 ± 1.03 ms). For each cell, at least six mIPSCs were required for averaging and for the measurement of τw (τw = τ1A1 + τ2(1 − A1), where τ1 and τ2 are the time constants of the first and second exponential functions, respectively, and A1 is the proportion of the first exponential function contributing to the amplitude of the IPSC). In a subpopulation of cells, peak-scaled nonstationary fluctuation analysis was used to calculate the single-channel conductance (γ) and number of channels open at the peak of the current (Nusser et al., 2001). The following criteria were used to ensure the time independence of our data during the recordings: access resistance (Ra) was subject to 70% compensation and was continuously monitored; if Ra changed >20% during the recording the cell was discarded from the analysis; all recordings were rejected if the uncompensated Ra became >20 MΩ. Furthermore, there were no correlations between uncompensated Ra, input resistance, or whole-cell capacitance and τw within each neuronal population. The effect of 100 nm zolpidem (see Fig. 13B) was calculated for each zolpidem-treated cell by computing the τw(steady-state zolpidem)/τw(baseline zolpidem) ratio and then subtracting the average of the τw(steady-state control)/τw(baseline control) ratios for all control (ACSF “treated”) cells of that neuronal type. Visualization of the recorded cells. After recordings, slices were placed in a fixative containing 4% paraformaldehyde and ∼0.2% picric acid in 0.1 m phosphate buffer (PB), pH 7.4, at 4°C for at least 24 h and then were extensively washed with 0.1 m PB and Tris-buffered saline (TBS) before further processing. For neurons recorded from the nucleus reticularis thalami, each slice was blocked in TBS with 10% normal goat serum (NGS) for 1 h and then incubated overnight in rabbit anti-parvalbumin primary antibody (Swant) diluted 1:1000 in TBS containing 0.1% Triton X-100 (TBST) and 2% NGS. Each thalamic slice was subsequently washed in TBS and then incubated in TBST containing Alexa Fluor 488-conjugated goat anti-rabbit secondary antibody (Invitrogen) diluted 1:500 and streptavidin-conjugated cyanine 3 (Cy3) diluted 1:500 (Jackson ImmunoResearch) to visualize the recorded cell. Other cell types were initially visualized with streptavidin-conjugated Cy3 (1:500 in TBST). All cells were viewed using an Olympus BX62 microscope equipped with appropriate fluorescence filters and a DP30BW charge-coupled device camera. A subset of external tufted cells was subsequently processed for three-dimensional reconstruction: slices were embedded in gelatin and resectioned at 60 μm thickness. Biocytin was visualized using avidin–biotin–horseradish peroxidase complex followed by a reaction with 3′3-diaminobenzidine tetrahydrochloride as chromogen and 0.01% H2O2 as oxidant for 12 min. Sections were then postfixed in 1% OsO4 for 20 min, stained in 1% uranyl acetate for 25 min, dehydrated in a graded series of ethanol, and embedded in epoxy resin (Durcupan). Neurons with no obvious truncations in their dendrites were fully reconstructed with the NeuroLucida system (Micro-BrightField Europe) attached to a Zeiss Axioscope 2 microscope using a 100× oil-immersion objective. Heterologous expression of recombinant GABAA receptors. Rat α3(M) (edited form) (Ohlson et al., 2007) and γ2L cDNAs were gifts from Marie Öhman (Stockholm University, Stockholm, Sweden). Rat α1 was a gift from Trevor Smart (University College London, London, UK). Rat β3 was a gift from Hartmut Lüddens (University of Mainz, Mainz, Germany). The coding region of each subunit was sequenced before use. HEK 293-H cells (Invitrogen) were grown in DMEM (Sigma-Aldrich) supplemented with 10% fetal bovine serum (Invitrogen), 100 U/ml penicillin (Sigma), 0.1 mg/ml streptomycin (Sigma) at 37°C, and 5% CO2, and were maintained according to standard protocols. Recombinant α1β3γ2L and α3β3γ2L GABAA receptors were expressed by cotransfecting α, β3, and γ2L cDNAs at a ratio of 1:1:10, together with enhanced green fluorescent protein (0.5) using Lipofectamine 2000 (Invitrogen). An excess of γ2L cDNA was used to minimize the likelihood of mixed αβ and αβγ receptors (Boileau et al., 2003, 2005). In each case, the total DNA used for transfection was 3.2 μg. After 18–24 h, the cells were split and plated on glass coverslips. Recordings were made 24–72 h later. Dual transfection of α1 and α3 was performed at three different cDNA ratios (α1α3; 1:1, 1:1.5, and 1:2) while maintaining the same total DNA and the αβγ ratio. Outside-out patch recording and ultrafast GABA application. HEK cells were viewed using a fixed-stage upright microscope, BX51WI (Olympus) and were perfused with “external” recording solution, containing the following (in mm): 140 NaCl, 2.5 CaCl2, 1.2 MgCl2, 4.7 KCl, 5 HEPES, 11 glucose; the pH was adjusted to 7.4 with NaOH. The temperature of the solution in the recording chamber (25.8 ± 0.6°C; n = 54 patches) was monitored using a miniature probe positioned close to the recording electrode (IT-21 thermocouple probe and TH-8 thermometer; Physitemp Instruments). Pipettes for outside-out patch recording were pulled from thick-walled borosilicate glass (1.5 mm outer diameter, 0.86 mm inner diameter; Harvard Apparatus) coated with Sylgard resin (Dow-Corning 184) and fire polished to a final resistance of 5–10 MΩ. The “internal” (pipette) solution contained the following (in mm): 140 CsCl, 4 NaCl, 0.5 CaCl2, 10 HEPES, 5 EGTA, 2 Mg-ATP; the pH was adjusted to 7.3 with CsOH. Ultrafast (1 ms duration) applications of GABA onto outside-out patches were achieved using a double-barreled application tool, made from theta glass (Hilgenberg) pulled to a tip opening of ∼200 μm and mounted on a piezoelectric translator (P-265.00; Physik Instrumente) attached to a micromanipulator (PatchStar; Scientifica). “Control” and agonist (1 mm GABA) solutions flowed continuously through the two barrels, and solution exchange occurred when movement of the translator was triggered by a voltage step (pClamp10; Molecular Devices). To enable visualization of the solution interface and allow measurement of solution exchange, 2.5 mg/ml sucrose was added to the agonist solution, and the control solution was diluted by 5%. The speed and duration of the solution exchange were estimated from the liquid junction current recorded from the open tip of the pipette at the end of each recording (minimum of 200 sweeps, after destruction of each patch). Liquid junction currents had a mean 10–90% rise time of 0.29 ± 0.02 ms and a mean duration (at half-height) of 0.99 ± 0.02 ms (n = 54). Recordings were made at −70 mV using an Axopatch 200A amplifier (Molecular Devices) (low-pass filter set at 10 kHz) and acquired using a Digidata 1440 interface board (Molecular Devices) and pClamp 10 software (Molecular Devices) at a sampling frequency of 50 kHz. Currents were analyzed using Igor Pro 6.10 (WaveMetrics) with NeuroMatic 2.6 (http://www.neuromatic.thinkrandom.com) after off-line filtering (eight-pole low-pass Bessel at 5 kHz; Clampfit 10; WaveMetrics). The deactivation of GABA-evoked currents was described by fitting with the sum of two to four exponential components. The weighted time constant of deactivation (τw,deact) was calculated as the sum of the time constants weighted by their fractional amplitudes. Similar results were obtained when current decay was assessed using a fit-independent method (charge transfer divided by the peak amplitude; data not shown). Male Wistar rats (P25–P40) were deeply anesthetized with a mixture of ketamine and xylazine (0.5 ml, i.p.) and transcardially perfused with 0.9% saline followed by a fixative containing 1–2% paraformaldehyde in 0.1 m Na-acetate buffer, pH 6.0 (Lorincz and Nusser, 2010). 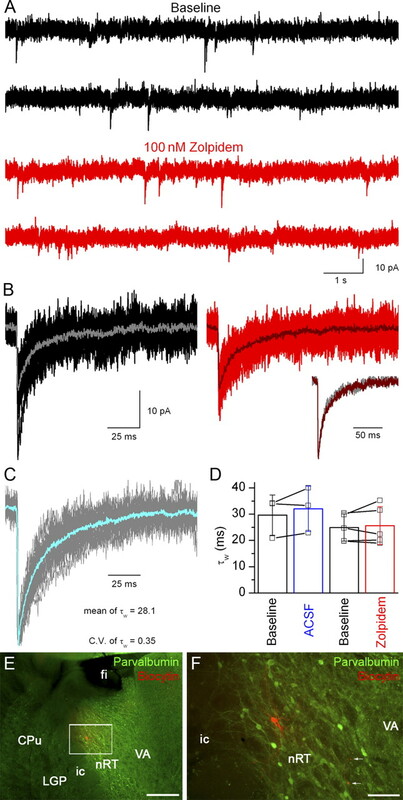 This fixation condition not only allows the visualization of voltage-gated Na+ channels in axon initial segments, it also allows the visualization of the synaptic enrichment of neurotransmitter receptors without antigen retrieval. After removing the brain from the skull, brain regions were carefully dissected and sections were cut using a VT1000S vibratome (Leica). After extensive washing in 0.1 M PB, sections were blocked in TBS with 10% NGS for 1 h and then incubated overnight with a mixture of primary antibodies diluted in TBST containing 2% NGS. Combinations of the following primary antibodies were used: rabbit anti-GABAAR α1 (diluted 1:2000; gift from W. Sieghart, Medical University of Vienna, Vienna, Austria); mouse anti-GABAAR α1 (diluted 1:1000; NeuroMAB, University of California, Davis, CA); guinea pig anti-GABAAR α1 (diluted 1:2000; gift from J.-M. Fritschy, University of Zurich, Zurich, Switzerland); guinea pig anti-GABAAR α2 (diluted 1:1000; gift from J.-M. Fritschy); guinea pig anti-GABAAR α3 (diluted 1:4000; gift from J.-M. Fritschy); rabbit anti-GABAAR α4 (diluted 1:500; gift from W. Sieghart); guinea pig anti-GABAAR α5 (diluted 1:1000; gift from J.-M. Fritschy); mouse anti-GABAAR β1 (diluted 1:1000; NeuroMAB); rabbit anti-GABAAR β2 (diluted 1:1000; gift from W. Sieghart); mouse anti-GABAAR β3 (diluted 1:2000; NeuroMAB); rabbit anti-GABAAR γ2 (diluted 1:2000; Synaptic Systems); mouse anti-gephyrin (diluted 1:2000; Synaptic Systems); and rabbit anti-neuroligin-2 (diluted 1:500; Synaptic Systems). Sections were then washed in TBS and incubated in a mixture of appropriate secondary antibodies: goat anti-rabbit, donkey anti-guinea pig, and goat anti-mouse conjugated to Alexa Fluor 488 (Invitrogen), Cy3, or Cy5 (Jackson ImmunoResearch) (all diluted 1:500 in TBS containing 2% NGS) for 2 h. Slices were then washed in TBS, mounted, and viewed using an Olympus FV1000 confocal microscope. 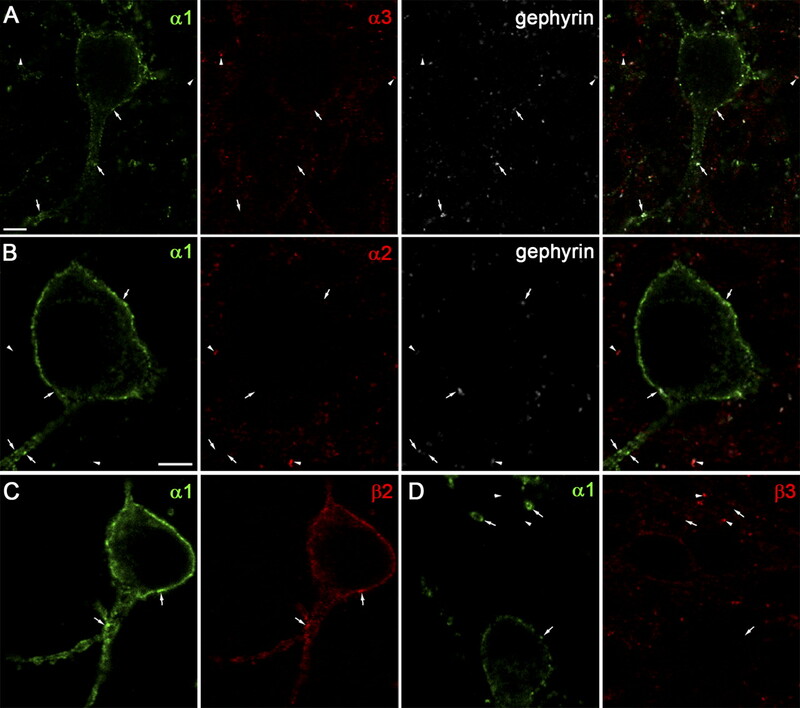 For quantitative measurements, triple labeling for the GABAAR α1 and α3 subunits and gephyrin were examined, and 29 external tufted cell somata and proximal dendrites, identified by their large diameters and juxtaglomerular somatic locations, were analyzed. 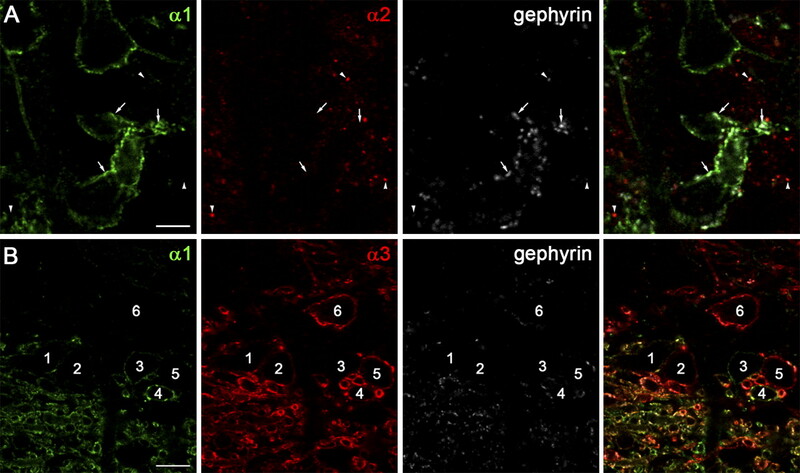 Regions of interest were drawn around clusters of gephyrin immunoreactivity, and the average fluorescence intensity for each cluster was calculated for both the α1 and the α3 subunits using FluoView confocal microscope software (Olympus). All chemicals, drugs, and reagents were purchased from Sigma unless stated otherwise. All data are expressed as mean ± SD unless stated otherwise. An unpaired Student's t test for independent samples was used to compare within and between ACSF and zolpidem recording groups, as appropriate. Comparison between τw,deact values for different recombinant GABAA receptors was made using Tukey's honestly significant difference (HSD) test, and segregation of τw,deact values for different recombinant GABAA receptors was performed using k-means clustering; both analyses were performed using R 2.14.0 (The R Foundation for Statistical Computing; http://www.R-project.org). Studies on recombinant GABAARs have demonstrated that α subunits have a major role in determining the affinity of GABAARs for GABA and for many pharmacological agents. However, the correlation between the kinetics of IPSCs and the subunit composition of synaptic GABAARs is less clear in nerve cells in situ because of the multiplicity of subunits expressed in most neuron types. Fluorescent immunolabeling experiments were therefore performed with antibodies against the α1, α2, α3, α4, α5, β1, β2, β3, and γ2 subunits in brain sections that were prepared in a way that allows their detection in synaptic junctions (see Materials and Methods). Antibodies to gephyrin and neuroligin-2 were used in multiple immunolabeling experiments to define GABAergic synapses (Sassoè-Pognetto and Fritschy, 2000). In our reactions, we observed a lack of synaptic clustering of the α4 and α5 subunits, consistent with previous observations (Brünig et al., 2002; Crestani et al., 2002; Wei et al., 2003; Farrant and Nusser, 2005); therefore, immunoreactivity for these two subunits will not be discussed further. The patterns of immunolabeling in the CNS under our experimental conditions appeared very similar to those described previously using different fixation and antigen presentation conditions (Fritschy and Mohler, 1995; Pirker et al., 2000). However, at high magnifications, our labeling was more punctate, similar to those reactions in which antigen retrieval methods were used (Fritschy et al., 1998; Schneider Gasser et al., 2006). We first asked how the synaptic subunit composition and mIPSC decay correlate in nerve cells that express mainly a single α subunit type as α subunit in their synapses. Many neuronal populations were examined in the cerebral and cerebellar cortices, hippocampus, MOB, and thalamic nuclei until such cell types were identified. In the MOB, the external plexiform layer (EPL) showed strong immunoreactivity for four α and all three β subunit isoforms (Fig. 1), consistent with the expression of multiple GABAAR subtypes by mitral and tufted cells. In the internal plexiform layer (IPL) and granule cell layer (GCL), discrete, strongly α1 subunit-labeled interneurons were scattered among α2- and α3-immunopositive clusters of GCs. In our previous study (Eyre et al., 2008), we identified these strongly α1-positive cells as deep short-axon cells with axonal projections to the EPL (EPL-dSACs). The gephyrin-immunopositive clusters on EPL-dSACs were strongly labeled for the α1 but were immunonegative for the α2 and α3 subunits (Fig. 2A,B). The β2 subunit was found to have an expression pattern almost identical to that of the α1 subunit, whereas the β3 subunit strongly colocalized with α2 and α3 subunit-immunopositive clusters and also with the nonsynaptic α5 subunits in GCs (Fig. 2C,D). The γ2 subunit was present in virtually all gephyrin-positive clusters in the MOB. In summary, in the inframitral layers of the MOB, EPL-dSACs expressed synaptic α1, β2, and γ2 subunits, whereas GCs contained mainly the α2, α3, β3, and γ2 subunits in their synapses at detectable levels. Immunofluorescent labeling for GABAAR subunits in the main olfactory bulb. Low-magnification images of representative immunofluorescent reactions encompassing the various layers of the main olfactory bulb are shown. Bottom right, Triple labeling for the α1, β3, and γ2 subunits. Scale bar, 50 μm (applies to all panels). GL, Glomerular layer; MCL, mitral cell layer. 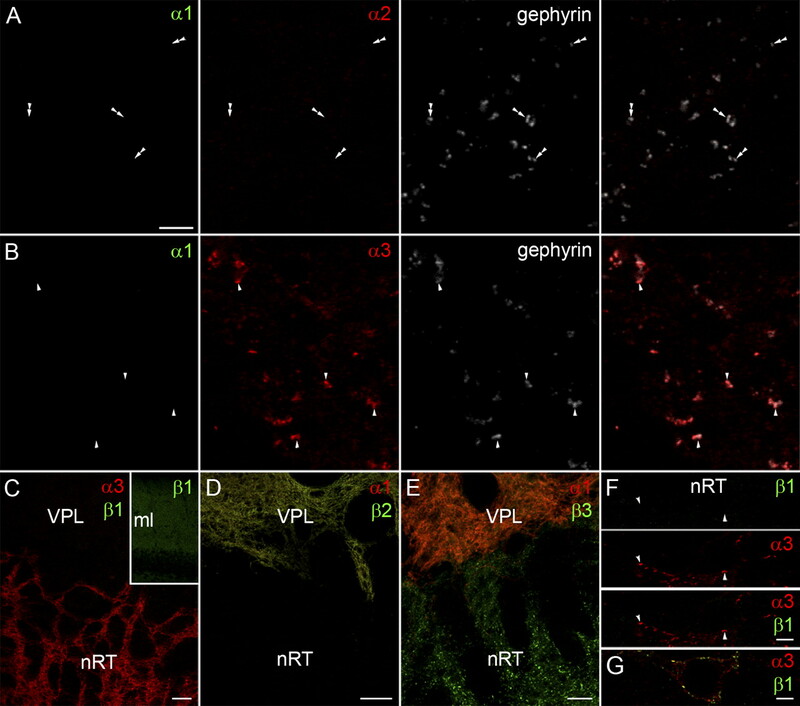 Multiple immunofluorescent labeling for GABAA receptor subunits in the inframitral layers of the main olfactory bulb. A, Immunoreactivity for the α1 subunit (green) delineates the somatodendritic membranes of a dSAC. α1-Immunopositive clusters (arrows) that also show labeling for the synaptic marker gephyrin (gray) are all immunonegative for the α3 subunit (red). α3-Immunopositive clusters (arrowheads) are negative for the α1 subunit. B, An α1-immunopositive dSAC is immunonegative for the α2 subunit (red). The α2 subunit-positive clusters originate from GCs. Immunolabeling for gephyrin (gray) indicates GABAergic synapses. α1 (arrows) and α2 (arrowheads) subunit-immunopositive puncta also contain gephyrin, demonstrating the synaptic enrichment of these GABAAR subunits. C, D, α1-Immunopositive clusters (green) in a dSAC (arrows) contain strong immunolabeling for the β2 (C, red), but not for the β3 (D, red), subunit. Strong β3-immunopositive clusters belong to GCs. Scale bars: (in A, B) A–D, 5 μm. C and D are in the same magnification as A. Next, we investigated the kinetic properties of uniquantal mIPSCs in the α1, β2, and γ2 subunit-expressing EPL-dSACs by making whole-cell voltage-clamp recordings from morphologically verified EPL-dSACs in acute MOB slices (Fig. 3). To prevent complications in the interpretation of mIPSC decay kinetics as a result of differential dendritic filtering, we restricted our analysis to mIPSCs with 10–90% rise times <500 μs, indicating a predominantly perisomatic origin (see Materials and Methods). In EPL-dSACs, mIPSCs occurred at a frequency of 0.50 ± 0.44 Hz (n = 14 cells; Fig. 3A) and had an amplitude of 45.0 ± 17.1 pA, and their decay could be well fitted with the sum of two exponential functions, resulting in a τw of 5.0 ± 1.0 ms. Peak-scaled nonstationary variance analysis gave a weighted mean single-channel conductance of 31.5 pS (Fig. 3B). This value is consistent with the conductance of recombinant α1β3γ2 receptors at this temperature (Angelotti and Macdonald, 1993), indicating that the variance in the decay of mIPSCs within a single dSAC could be ascribed fully to the stochastic opening-closing behavior of the underlying channels. There was also very little variability in the τw among individual EPL-dSACs (coefficient of variation [CV]) of τw = 0.21; Fig. 3C). mIPSC kinetics and pharmacology of main olfactory bulb dSACs. A, Continuous current recordings of mIPSCs from an EPL-dSAC (MDE471) before (black traces) and after (red traces) bath application of 100 nm zolpidem. B, Superimposed consecutive mIPSCs before (black, average in gray) and after (red, average in dark red) the application of 100 nm zolpidem. Right inset shows peak-scaled averaged mIPSCs, demonstrating that zolpidem slowed the decay of mIPSCs. Left inset illustrates a plot of mean current against current variance (peak-scaled nonstationary fluctuation analysis). Parabolic fit indicates a single-channel conductance (γ) of 31.5 pS and that 40 channels open at the peak of the averaged mIPSC (Np). C, Peak-scaled averages of baseline recordings from 14 morphologically identified EPL-dSACs (gray) and the population mean trace (cyan). τw of the population mean and CV are indicated. D, Summary of the effects of ACSF (p = 0.37, paired t test, n = 4) or 100 nm zolpidem (p = 0.004, paired t test, n = 4) on the weighted decay time of mIPSCs. To provide another test of the subunit content underlying mIPSCs in EPL-dSACs, we used the imidazopyridine zolpidem, which has been shown to displace the benzodiazepine antagonist Ro15-1788 from α1β3γ2, α2β3γ2, α3β3γ2, and α5β3γ2 GABAARs with Ki values of 20, 450, 400, and 15,000 nm, respectively (Pritchett and Seeburg, 1990). Based on these recombinant GABAAR data, we chose to use zolpidem at a concentration of 100 nm, thus providing a pharmacological tool to distinguish between α1 and α2/α3 subunit-containing receptors. Figure 3 shows recordings of mIPSCs from an EPL-dSAC during the baseline condition and after wash-in of 100 nm zolpidem. In the cell illustrated, there was a clear slowing of the decay of the averaged mIPSCs (Fig. 3B, insets). Across EPL-dSACs, the relative increase (50%) in τw following zolpidem application was significantly greater (p = 0.004, unpaired t test; Fig. 3D) than that seen following ACSF application (6%), demonstrating that zolpidem at 100 nm affects the decay of mIPSCs in the α1 subunit-expressing EPL-dSACs. The frequency and peak amplitude of mIPSCs were unaffected. Interneurons in the cerebellar molecular layer (stellate and basket cells) are a well characterized neuronal population known to express the α1, but no other α, subunit (Viltono et al., 2008). Our immunofluorescent experiments confirmed this and demonstrated extensive synaptic colocalization of the α1 subunit with β2, β3, and γ2 subunits in the somata and dendrites of these cells (data not shown). We performed whole-cell recordings from 14 morphologically verified stellate/basket cells, which exhibited mIPSCs with a frequency of 0.69 ± 0.37 Hz, a peak amplitude of 61.1 ± 18.9 pA, a τw of 3.9 ± 0.6 ms, and a very small cell-to-cell variability in τw (CV = 0.15). In the subpopulation of cells treated with 100 nm zolpidem, an increase in τw was detected (from 3.7 ± 0.8 ms to 6.8 ± 2.0 ms; n = 4). This slowing of the decay was significantly different from that observed during 22 min of recording in the continuous presence of ACSF (relative increase in zolpidem, 82%; relative increase in ACSF, 39%; p = 0.01, unpaired t test). 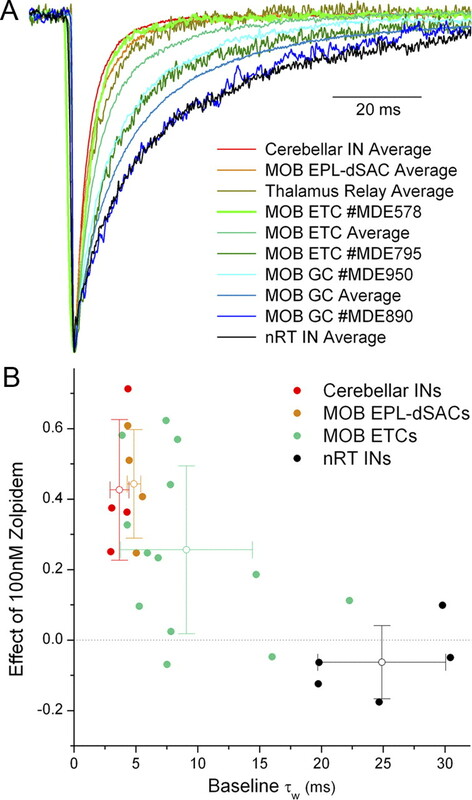 The decay time constant of mIPSCs and the significant effect of 100 nm zolpidem in cerebellar molecular layer interneurons are remarkably similar to those seen in EPL-dSACs. Relay cells of the ventral posterolateral nucleus of the thalamus also express only α1 as the α subunit, together with the β2, β3, and γ2 subunits (Fig. 4D,E). Miniature IPSCs recorded from these cells also had a fast decay (τw = 6.0 ± 2.1 ms), demonstrating that when α1 is the only synaptic α subunit isoform, mIPSCs have fast, zolpidem-sensitive decay kinetics. Multiple immunofluorescent labeling for GABAA receptor subunits in the VPL and the nRT. A, Neither α1 (green) nor α2 (red) subunit immunoreactivity is detected in the nRT in strong gephyrin immunoreactive clusters (double arrowheads). B, Strong, punctate α3 subunit immunoreactivity (red) is observed in the nRT, showing intense colocalization with gephyrin (arrowheads). C, Immunoreactivity for the β1 subunit (green) is not detected in the nRT (identified by the α3 immunoreactivity, red) or in the adjacent VPL, despite strong labeling in the dentate gyrus in the same section (inset). D, GABAAR α1 (red) and β2 (green) subunits colocalize in the VPL, but are both absent from the nRT. E, GABAAR β3 subunit (green) immunoreactivity in the nRT is strong and punctate, but it is much weaker in the adjacent α1 subunit-positive (red) VPL. F, G, High-magnification images indicate the lack of β1 immunoreactivity in nRT neurons covered by strong α3-immunoreactive puncta (F, arrowheads), whereas both α3 and β1 subunit-immunoreactive puncta are observed on somatic profiles in hippocampal interneurons (G). Scale bars: A, B, F, G, 5 μm; C, D, 50 μm; E, 20 μm. Scale bar in A applies to B. ml, Molecular layer of the dentate gyrus; VPL, ventral posterolateral thalamic nucleus. We next turned our attention to immunofluorescent reactions in the nucleus reticularis thalami (nRT), a brain area in which the α3 subunit is strongly expressed (Fritschy and Mohler, 1995). Our multiple labeling experiments demonstrated that the nRT was devoid of labeling for both the α1 and α2 subunits (Fig. 4A,B). In nRT, β1 and β2 subunit immunoreactivity was also absent, whereas strong punctate labeling was detected for the β3 and γ2 subunits (Fig. 4C–E). Recently, it has been suggested that the β1 subunit is present in a subpopulation of nRT cells (Huntsman and Huguenard, 2006); we therefore paid special attention to the localization of this subunit. When the reactions were analyzed at low magnifications, the nRT was completely immunonegative for the β1 subunit, but strong reactivity was detected in the hippocampal dentate gyrus in the same sections, demonstrating that our immunoreaction worked (Fig. 4C, inset). The strength and specificity of our β1 reaction is also illustrated by the confinement of labeling to the inner half of the EPL within the whole MOB (Fig. 1). At high magnifications, β1 subunit immunoreactivity was not detected in α3-immunopositive clusters in nRT cells (Fig. 4F), despite the fact that strong synaptic clustering of the β1 subunit was readily observed in the same α3-β1 colocalization experiments in hippocampal interneurons (Fig. 4G). Together, these experiments demonstrate that synaptic GABAARs in nRT cells have a subunit composition of α3β3γ2. Recordings of mIPSCs from nRT cells indicated that mIPSCs occurred at a variable frequency (from 0.02 to 0.38 Hz) and that their amplitudes were small (19.6 ± 5.5 pA; Fig. 5A,B), consistent with previous electrophysiological data (Huntsman and Huguenard, 2000; Browne et al., 2001). The 10–90% rise times of these mIPSCs were considerably slower than those recorded in MOB dSACs and cerebellar stellate/basket cells, consistent with the much slower on-rate of GABA for α3 subunit-containing GABAARs (Gingrich et al., 1995; Barberis et al., 2007; Picton and Fisher, 2007). We therefore selected mIPSCs with 10–90% rise times <1.5 ms for the analysis of their decays. The τw of mIPSCs in nRT cells was 28.1 ± 9.8 ms (Fig. 5C), consistent with previous recordings performed at similar temperature and from animals of similar age (Huntsman and Huguenard, 2000; Browne et al., 2001). Our pharmacological experiments demonstrated that the very slow decay kinetics were unaffected by 100 nm zolpidem (relative increase in zolpidem, 2%; relative increase in ACSF, 8%; p = 0.4, unpaired t test; Fig. 5D). Only cells positively identified as nRT neurons by their somatic location within the parvalbumin-immunoreactive nRT (Fig. 5E,F; same cell as shown in Fig. 5A,B) were included in our analyses. mIPSC kinetics and pharmacology in identified nRT cells. A, Continuous current recordings of mIPSCs from an nRT cell (MDE816) before (black traces) and after (red traces) the bath application of 100 nm zolpidem. B, Superimposed, consecutive mIPSC traces before (black, average in gray) and after (red, average in dark red) 100 nm zolpidem application. Peak-scaled averages (right-hand inset) show the lack of effect of zolpidem. C, Peak-scaled averages of baseline recordings from 22 morphologically identified nRT cells (gray) and the population mean average trace (cyan). τw of the population mean and CV are indicated. D, Summary data showing the effects of ACSF (p = 0.33, paired t test; n = 3) and 100 nm zolpidem (p = 0.60, paired t test; n = 5) on mIPSC mean τw. E, A biocytin-filled nRT cell (red) is located within the parvalbumin-immunoreactive nRT (green). F, Higher-magnification view of the boxed region in E. Scale bars: E, 500 μm; F, 100 μm. fi, Fimbria; CPu, caudate–putamen; LGP, lateral globus pallidus; ic, internal capsule; VA, ventral anterior thalamic nucleus. Having identified neuronal types that express synaptic GABAARs containing a single α subunit isoform and having established that the τw of mIPSCs originating from α1 subunit-containing synapses is five to seven times faster than that seen for α3 subunit-containing synapses, we next turned our attention to cells that express two different synaptic α subunit types. As mentioned, in central neurons the expression of multiple GABAAR subtypes is more of a rule than an exception, and we could therefore select from a large number of cell types for detailed investigation (e.g., from MOB mitral, MOB tufted, MOB granule, cortical and hippocampal pyramidal, cerebellar granule cells). In a recent study, Panzanelli et al. (2005) elegantly demonstrated that the α1 and α3 subunits are very strongly expressed in external tufted cells (ETCs) of the MOB; therefore, we chose this cell type and analyzed multiple labeling experiments in the superficial layers of the MOB (Fig. 6). In our reactions, we also detected both the α1 and α3 subunits in ETCs, where they showed a variable degree of colocalization. Some cells strongly expressed the α1 subunit, some the α3 subunit, and some both subunits (Fig. 6B). The α2 subunit is also found in the superficial MOB layers, but it showed no synaptic colocalization with the α1 subunit (Fig. 6A). Unfortunately, our antisera against the α2 and α3 subunits were both raised in guinea pigs, precluding their direct comparison, but we never found strongly α2 subunit-labeled large cells with pronounced apical dendrites, consistent with a previous study showing that the α2 subunit is present in GABAergic periglomerular cells (PGCs) (Panzanelli et al., 2007). Immunoreactivity for the β1 subunit was confined to the inner half of the EPL without any detectable reactivity in ETCs (Fig. 1). Immunolabeling for the β2 subunit was virtually identical to that for the α1 subunit, whereas the β3 subunit showed extensive synaptic colocalization with the α3 subunit in ETCs (Fig. 1). The γ2 subunit showed punctate labeling (Fig. 1) and had a prevailing colocalization with gephyrin. 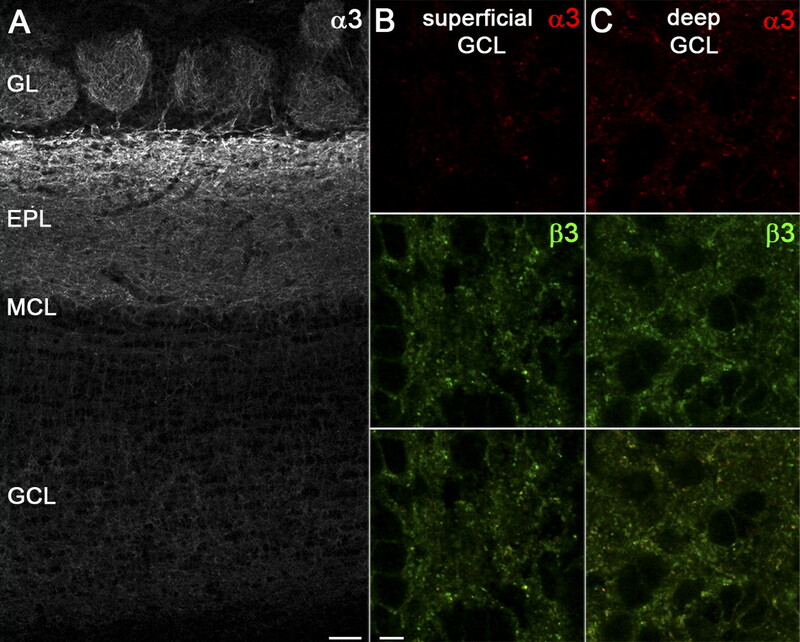 Multiple immunofluorescent labeling for GABAAR subunits in the supramitral layers of the main olfactory bulb. A, GABAAR α1 subunit immunoreactivity (green) in the glomerular layer delineates the somatic membrane of many juxtaglomerular cells but does not colocalize with the α2 subunit (red). Punctate gephyrin labeling (gray) is associated with both the α1 (arrows) and α2 (arrowheads) subunits. B, GABAAR α1 (green) and α3 (red) subunit immunoreactivity in the glomerular layer show highly variable colocalization, such that puncta on individual somatic and dendritic membranes in the overlay appear as various shades of green (cells 3 and 4), orange (cells 2 and 5), yellow (cell 1), and red (cell 6). Scale bars: A, 5 μm; B, 10 μm. Qualitative analysis of the colocalization reactions already suggested that ETCs do not simply form three distinct subpopulations based on their α1 and α3 subunit immunoreactivity, because there is a wide range of red, orange, yellow, and green hues in the superimposed color images (Figs. 6B, right, 7A). Such variability was also evident in cell bodies and dendritic profiles located in the outer portion of the EPL and in the juxtaglomerular region. To express this finding more objectively, we quantitatively analyzed triple-labeled confocal images. We measured the fluorescence intensities of the α1 and α3 subunits using gephyrin immunofluorescence to independently delineate small regions of interest (clusters) representing putative synapses. Clusters associated with the same somatic profile were individually analyzed to calculate the within-cell, cluster-to-cluster variance. The yellow and green histograms of the α3/α1 intensity ratios of two representative cells in Figure 7C demonstrate the small within-cell variability from cluster to cluster. However, a much larger variability was obtained when the α3/α1 intensity ratios were averaged for individual cells and were plotted for all ETCs (Fig. 7C). A scatter plot of the α1 versus the α3 intensities (average of all clusters within a given cell) clearly demonstrated the lack of three distinct clusters of cells (strong α1, no α3; no α1, strong α3; strong α1, strong α3); instead, the entire space in the plot in Figure 7B was apparently filled uniformly. 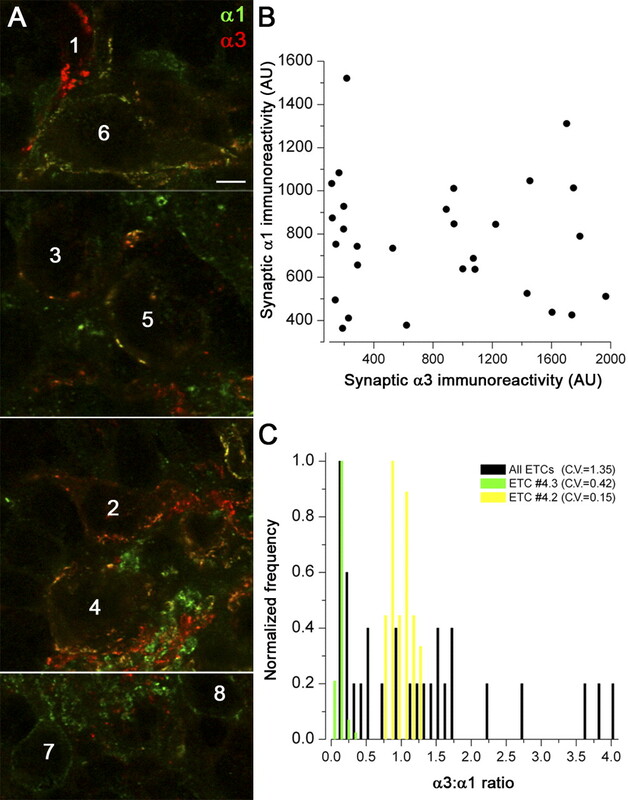 Quantitative analysis of immunofluorescent labeling of synaptic GABAARs in ETCs. A, Different ETCs show a range of α3/α1 subunit ratios visualized by the different color hues between green (cells 6, 7, and 8), yellow (cells 4 and 5), orange (cells 2 and 3), and red (cell 1). B, Plot of average α3 subunit against average α1 subunit immunofluorescence intensity of all puncta for each of 29 ETCs. Note the large heterogeneity in the intensities of both subunits, and note that cells occupy the entire parameter space; no clear clusters are evident. C, Distribution of the α3/α1 intensity ratio for 29 ETCs (black bars). Distributions of individual puncta from two cells are shown in the yellow and green histograms. As an example, the small variance (CV = 0.15) of the yellow distribution indicates that the synapse-to-synapse variability in the α3/α1 subunit ratio within a single cell is low. The large variance (CV = 1.35) of the total distribution shown in black demonstrates the large cell-to-cell variability in the α3/α1 ratio. Scale bar, 5 μm. Next, we performed whole-cell, voltage-clamp recordings of mIPSCs from a total of 54 morphologically identified ETCs (Fig. 8). Recordings from two individual cells are shown in Figure 8A–D, demonstrating two very different mIPSC decay kinetics. The τw in the ETC population varied over a wide range of values (CV = 0.58; Fig. 8E); the quickest decay (τw = 3.3 ms) was as fast as those recorded in α1 subunit-expressing EPL-dSACs and stellate/basket cells, whereas the slowest decay (τw = 29.8 ms) was as slow as those recorded in α3 subunit-expressing nRT cells. As a result, the mean τw (9.3 ms) lay somewhere between the extremes seen with α1-only- and α3-only-expressing cell types. When we analyzed the effect of 100 nm zolpidem in a subset of the ETC population, a significant increase (p = 0.04, unpaired t test) in the τw of mIPSCs was detected (relative increase, 39%) compared with that of ACSF (relative increase, 13%; Fig. 8F). However, the effect of zolpidem was not uniform but depended on the initial τw of the mIPSCs. ETCs with fast mIPSC decay kinetics were highly sensitive to zolpidem (Fig. 8B), whereas ETCs with slow kinetics were not (Fig. 8D). In addition to the analysis of individual cells, the strong dependence of the zolpidem effect on the τw is clearly seen when all cells are plotted together (see Fig. 13B). Because cells in the juxtaglomerular region of the MOB are morphologically and functionally diverse, we performed post hoc analysis of all our recorded cells (Fig. 9), and only identified ETCs were included in our analysis (Pinching and Powell, 1971). In a previous study from our laboratory, we identified two distinct subpopulations of ETCs based on their intrinsic electrophysiological and morphological properties (Antal et al., 2006). Keeping this heterogeneity in mind, we asked whether some of the variability in the τw of mIPSCs of ETCs could be the result of their morphological diversity. We found that ETCs, both with and without basal dendrites that extend into the EPL, could have either fast or slow mIPSC τw values (Fig. 9). mIPSC kinetics and pharmacology in ETCs. A, C, Continuous current recordings of mIPSCs from two ETCs (left, MDE599; right, MDE542) before (black traces) and after (red traces) the bath application of 100 nm zolpidem. B, D, Superimposed consecutive mIPSC traces before (black, average in gray) and after (red, average in dark red) 100 nm zolpidem application. Insets show peak-scaled averaged mIPSCs of baseline (gray) and zolpidem (dark red) of each cell for comparison. Note that the decay of the fast mIPSCs in B is prolonged by zolpidem, whereas that of the slow mIPSC in D is affected to a much smaller extent. E, Superimposed peak-scaled averages of baseline recordings from 54 ETCs (gray) and the population mean average trace (cyan). τw of the population mean and the CV are indicated. F, Summary data showing the effects of ACSF (p = 0.16, paired t test, n = 12) and 100 nm zolpidem (p < 0.001, paired t test, n = 13) on mIPSC τw. The kinetics of mIPSCs do not correlate with the dendritic morphology of ETCs. A, B, Neurolucida reconstructions of representative ETCs with fast mIPSC kinetics that lack (B, MDE758, orange cell) or that have (A, MDE798, green cell) basal dendrites in the EPL. C, D, Examples of ETCs with slow mIPSC kinetics are shown without (C, MDE750, cyan cell) and with (D, MDE795, blue cell) basal dendrites. Central inset shows peak-scaled peak-aligned averaged mIPSCs of the color-coded cells with τw indicated. Scale bars: 25 μm. GL, Glomerular layer. In examining the immunoreactivity of the α3 subunit in the MOB GCL, we noticed a gradient in both the strength of the reaction and the frequency and intensity of the puncta (Fig. 10A). When we examined double α3- and β3-immunolabeled reactions, the frequency of α3 subunit-immunopositive clusters that were also β3 subunit immunopositive was much higher in the deep than in the superficial part of the GCL (Fig. 10, compare B, C). Because such a gradient was not observed for the α2 subunit, we predicted that the α2/α3 ratio varies in GCs located at different depths from the mitral cell layer in the GCL. Unfortunately, our antibodies against the α2 and α3 subunits were both raised in guinea pigs, precluding the direct quantitative examination of this prediction in double-labeled reactions. We addressed the functional consequences of this potential synaptic α2/α3 subunit variability by recording mIPSCs under conditions identical to those of GCs with somatic locations at various depths in the GCL. Miniature IPSCs had a frequency of 0.08 ± 0.05 Hz (n = 48 cells), a peak amplitude of 64.1 ± 21.4 pA, and a τw of 18.7 ± 7.3 ms (Fig. 11A–C). The mIPSC decay times showed large variability (CV = 0.38; Fig. 11C) ranging from 7.2 to 37 ms. Such large variability is consistent with variable subunit composition of postsynaptic GABAA receptors. Because our immunofluorescent reactions demonstrated a deep-to-superficial gradient in the α3 subunit immunoreactivity, we plotted the τw of mIPSCs as a function of the somatic location in the GCL. Figure 11D demonstrates that the decay of mIPSCs in deep GCs is slower than in those located in the superficial region close to the IPL. Because the deactivation time constant of GABA-evoked currents in α2 subunit-containing receptors is faster than that in α3-containing receptors, this result is consistent with a proportionally higher contribution of the α3 subunit to synaptic receptors in deep GCs. Immunofluorescent localization of the α3 subunit in the MOB. A, Low-magnification view of the distribution of the α3 subunit in the MOB. Note the large difference in intensity between ETCs and GCs. Within the GCL, the signal strength increases from superficial to deep zones. B, C, High-magnification views of double-immunofluorescent labeling for the α3 and β3 subunits in superficial (B) and deep (C) GCL. Note that there are many more α3 subunit-immunopositive clusters in the deep GCL than in the superficial part and that all these α3 subunit-positive clusters colocalize with the β3 subunit. Scale bars: A, 50 μm; B, C, 5 μm. Scale bar in B applies to C.
Properties of mIPSCs in MOB GCs. A, Continuous current recordings from a GC (MDE525) before (black traces) and after (red traces) bath application of 100 nm zolpidem. B, Superimposed consecutive mIPSCs before (black, average in gray) and after (red, average in dark red) 100 nm zolpidem application. Inset shows peak-scaled averages, demonstrating the lack of zolpidem effect on mIPSC kinetics. C, The population mean average mIPSC trace (cyan) is superimposed on the peak-scaled averaged mIPSCs from 48 GCs (gray). τw of the population mean and the CV are indicated. D, τw of the mIPSCs shows a positive correlation with the distance of the GC somata from the MCL; the deeper the somatic location, the slower the mIPSC τw. The correlation coefficient of a linear fit (black line) to the data is indicated. MCL, Mitral cell layer. Although receptor deactivation following GABA removal plays a key role in determining the decay of IPSCs, little is known about how this is affected by the coexpression of mixed α subunits. To investigate this, we examined the deactivation kinetics of heterologously expressed recombinant GABAA receptors. Specifically, we recorded macroscopic currents evoked by ultrafast (1 ms duration) application of 1 mm GABA onto membrane patches excised from HEK cells transfected with cDNAs for β3 and γ2L, together with α1, α3, or both α1 and α3 cDNAs at different ratios (1:1, 1:1.5, and 1:2; see Materials and Methods). In all cases, current deactivation was multiexponential, requiring two (1/54), three (29/54), or four (24/54) exponential components for an adequate fit (Fig. 12A,C). For α1-only receptors, all currents (n = 6) were fit with three exponentials, with mean time constants of 4, 35, and 184 ms and fractional amplitudes of 58, 25, and 17%. For α3-only receptors, the currents were fit with either three (1.5, 37, and 480 ms; 40, 33, and 27%; n = 3) or four (1.8, 27, 192, and 1050 ms; 45, 32, 12, and 11%; n = 6) components. Accordingly, the mean τw,deact was greater for only α3 subunit-containing receptors (129.0 ± 54.0 ms) compared with only α1 subunit-containing receptors (42.2 ± 20.5 ms; p < 0.01, Tukey's HSD test; Fig. 12G). Although the current decays were substantially slower than those of mIPSCs—a common observation, likely reflecting the much briefer exposure to GABA in situ (Overstreet et al., 2002; Mozrzymas et al., 2003) or GABAA receptor association with synaptic proteins—the threefold difference in τw,deact was similar to the difference in τw seen for α1 and α3 subunit-expressing neurons and similar to the ratio seen in other studies of recombinant α isoforms (e.g., α1/α3β2γ2S, Barberis et al., 2007; and α1/α3β3γ2L, Nimmich et al., 2009). When α1 and α3 cDNAs were cotransfected, deactivation was variable, but mean values of τw,deact increased with the proportion of α3 cDNA transfected (Fig. 12E–G); with α1/α3 ratios of 1:1, 1:1.5, and 1:2, the mean τw,deact values were 49 ± 23, 77 ± 45, and 98 ± 57 ms (n = 7, 20, and 12), respectively. With dual α subunit transfection, there was no obvious trend toward intermediate values of τw,deact in individual patches; rather, as shown in Figure 12H, values were broadly spread, falling into two groups that overlapped either the only α1 or the only α3 subunit-containing channels. At a 1:1 transfection ratio, the kinetics remained α1 subunit like (100%; 7/7 patches), but the distribution shifted to 70% α1 subunit like (6/20 patches) and 50% α1 subunit like (6/12 patches) at transfection ratios of 1:1.5 and 1:2, respectively. These results suggest that differential expression of the α1 and α3 subunits could generate the range of mIPSC decay times seen in cells that express only these subunits. Deactivation kinetics of recombinant GABAA receptors expressed in HEK cells following transfection of α1, α3, or both α1 and α3 cDNA. A, Representative current evoked by 1 ms application of 1 mm GABA to a patch from an HEK cell expressing α1β3γ2L receptors. The black line is a superimposed triple exponential fit; the gray trace above is the residual. The inset shows the initial part of the record. B, The global average of normalized α1 currents (n = 6); the gray fill denotes the SEM. Inset shows the same trace on an expanded amplitude scale (record truncated) and slower time base. C, Same as A but for a current evoked in a patch from an HEK cell expressing α3β3γ2L receptors (black line is fit with four exponential components). D, Global average from nine α3β3γ2L patches (inset, same as in B). E, Three representative currents evoked in patches from HEK cells transfected with α1 and α3 cDNAs at a ratio of 1:1.5. The inset shows the average currents on an expanded amplitude scale (records truncated) and slower time base. F, Global averages of normalized currents for α1 and α3 cotransfected at ratios of 1:1, 1:1.5, and 1:2 (n = 7, 20, and 12, respectively). Inset shows the average currents on a different scale (same as in B, D), together with the α1 (blue) and α3 (red) averages for comparison. G, Box plots showing τw,deact for different α subunits. Boxes indicate 25–75th percentiles, and whiskers indicate the 10–90th percentiles; horizontal red bars denote median, and crosses denote mean values. Green circles indicate individual values. Asterisks indicate significant difference from α3β3γ2L receptors (**p < 0.01, Tukey's HSD test). H, Plot showing τw,deact values for all patches. For those cells transfected with both α1 and α3 cDNAs (open symbols), k-means clustering of pooled data identified two clusters (open blue and open red symbols) with means of 52 and 139 ms. These clusters overlapped with the α1-only (filled blue symbols) and α3-only groups (filled red symbols), respectively. In the present article, we describe a strategy allowing the decay of inhibitory synaptic currents to be set through the expression of different amounts of two synaptic GABAAR α subunit isoforms, which on their own confer distinct decay kinetics to the IPSCs. By adopting this strategy, MOB ETCs are able to generate mIPSCs with a wide repertoire of kinetics, with τw ranging from 3 to 30 ms. These values span the full spectrum of τw, encompassing values obtained from α1 subunit-expressing cerebellar stellate/basked cells (4 ms) and those of α3 subunit-expressing nRT cells (28 ms; Fig. 13). 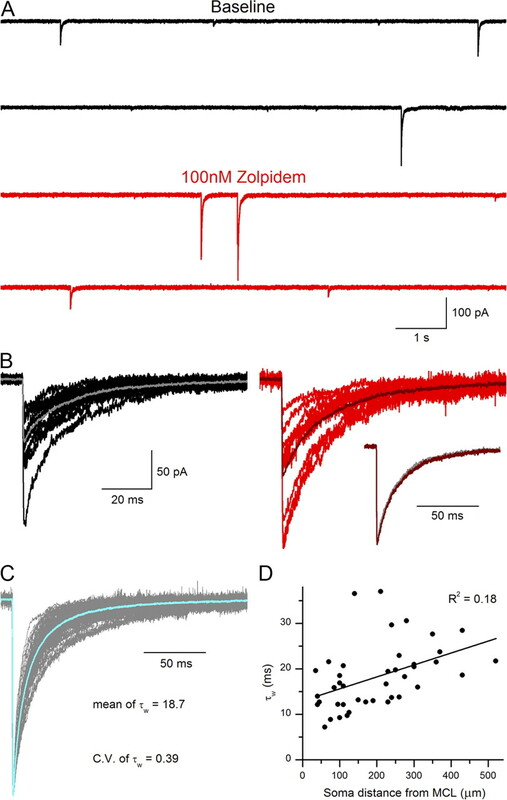 Summary of the kinetics and zolpidem sensitivity of mIPSCs recorded from a variety of nerve cells under identical conditions. A, Peak-scaled, peak-aligned population average traces demonstrating the different kinetics underlying different GABAAR α subunit expression in different cell types. Note that the ETC average (bright green) falls between the other population averages (i.e., red-orange and blue-black). Two individual ETCs with fast (MDE578, light green) and slow (MDE795, dark green) decay kinetics are also shown. Similarly, fast (MDE950, light blue) and slow (MDE890, dark blue) individual GCs are shown. The two individual cells (GC and ETC) represent the ∼15th and ∼85th percentiles of the population. B, Plot of the effect of 100 nm zolpidem as a function of the initial τw of mIPSCs. 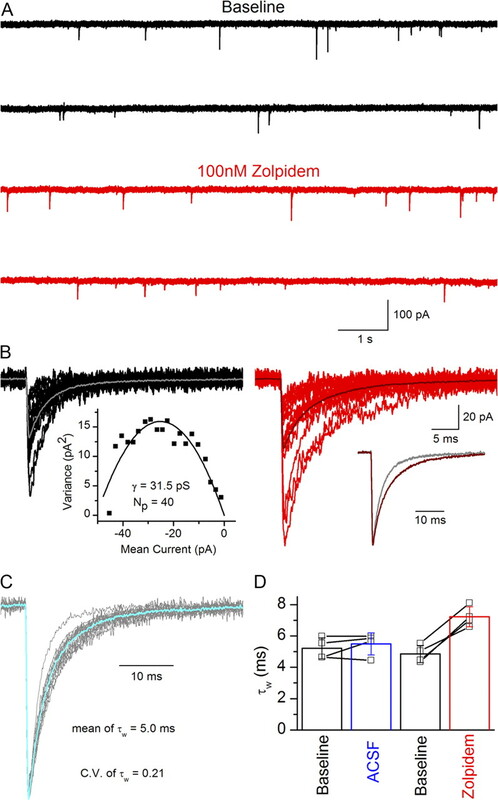 Zolpidem strongly affects the decay of mIPSCs in cells with fast kinetics [cerebellar interneurons (INs), MOB EPL-dSACs] but has no effect on cells with slow kinetics (nRT cells). The effect of zolpidem on the decay of MOB ETC mIPSCs depends on the initial decay time constant of the mIPSCs. Differences in agonist affinity, gating, and pharmacological properties have been clearly observed when systematically varying the α subunit of recombinant GABAARs (Verdoorn et al., 1990; Macdonald and Olsen, 1994; Gingrich et al., 1995; Tia et al., 1996; Lavoie et al., 1997; Vicini, 1999; Bianchi et al., 2002; Picton and Fisher, 2007; Bright et al., 2011). Building on this, we have investigated the role of different GABAAR α subunits in determining the time course of IPSCs in various neuronal types in situ that express only a single type of GABAAR α subunit. Using high-resolution immunolocalization experiments with subunit-specific antibodies, we were able to identify three cell types in which the α1 subunit, and one in which the α3 subunit, is the only synaptic α subunit type. The decays of the mIPSCs in the three α1 subunit-expressing cell types (cerebellar interneurons, thalamic relay cells, and MOB EPL-dSACs) were remarkably similar to each other (4.0 ± 0.6, 6.0 ± 2.1, and 5.0 ± 1.0 ms) but were very different from the α3 (28.1 ± 9.8 ms) subunit-expressing nRT cells. It is important to stress that the actual decay values are highly temperature dependent; these values would be approximately halved at physiological temperatures, consistent with data obtained in only α1 subunit-expressing hippocampal interneurons (2 ms; Bartos et al., 2001) and with data obtained in nRT cells recorded at physiological temperatures (22 ms; Huntsman and Huguenard, 2000). These results are consistent with the notion that the primary determinant of the decay of GABAAR-mediated IPSCs is the receptor subunit composition. We would like to emphasize that we have no intention to suggest that the spatiotemporal profile of GABA in the synaptic cleft (Auger et al., 1998; Williams et al., 1998) and the phosphorylation state of the postsynaptic receptors (Jones and Westbrook, 1997; Nusser et al., 1999) do not affect the decay of the IPSCs. However, it is clear that the less than twofold effect of these mechanisms is much less pronounced than the sevenfold difference seen between cells that express different α subunits. Our data regarding the decay of mIPSCs generated at α1β2γ2 and α3β3γ2 GABAAR-containing synapses are consistent with our experiments using ultrafast GABA application on outside-out patches containing recombinant GABAARs containing different α subunits. Because the deactivation properties of receptor populations formed when both α1 and α3 subunits are expressed were unknown, we performed experiments in which we varied the cDNA ratio of the α1 and α3 subunits. Our results with mixtures of recombinant receptors mimicked our data from MOB ETC synapses, demonstrating that any deactivation time constant between that of pure α1 or pure α3 subunit-containing receptors can be produced by varying the relative amounts of these two subunits. Importantly, as in MOB ETCs seen to express both α1 and α3 subunits, we cannot make conclusions regarding the presence of mixed populations of only α1 and only α3 subunit-containing receptors or the presence of receptor populations containing both α1 and α3 subunits (Duggan et al., 1991; Benke et al., 2004) or indeed of receptors with varied subunit arrangements (Minier and Sigel, 2004). Nevertheless, our results suggest that variations in the expression of the α1 and α3 subunits can account for the range of mIPSC decay times seen in cells that express only these subunits. Although A-to-I RNA editing of the α3 subunit is reported to speed current deactivation (Nimmich et al., 2009), it is unlikely to contribute to heterogeneous IPSC kinetics, as editing is nearly complete at the ages studied here (Ohlson et al., 2007). One difference between the subunit composition of postsynaptic GABAARs in MOB EPL-dSACs versus cerebellar stellate/basked cells and thalamic relay cells is the absence versus the presence of the β3 subunit. We observed small differences in the decay of mIPSCs of these cell types, but the presence or absence of the β3 subunit did not correlate with the mIPSC decay times, suggesting that it is not the presence or the absence of the β3 subunit that is responsible for the small difference in their mIPSC decay times. Identifying the influence of α1 versus α3 subunit-containing postsynaptic GABAARs on the decay of IPSCs raises the issue of whether all nerve cells could fulfill their functional requirement with either very fast (4–5 ms) or very slow (28 ms) IPSCs. Thus far, no other cell type has been reported in which the cell-to-cell variability in the decay of IPSCs spans this whole spectrum of kinetics (4–28 ms). For example, the slowest τw among cerebellar interneurons was 5 ms, whereas it was 6.7 ms in EPL-dSACs. These values are much smaller than that of the fastest decaying IPSCs in nRT cells (16 ms). Thus, if every nerve cell only expressed either the α1 or the α3 subunit, it would be impossible to generate the whole intermediate range of decay times (from 7 to 16 ms). To circumvent this problem, we believe that nerve cells use the strategy of expressing multiple synaptic GABAAR subunit isoforms, with either a constant or a variable ratio from cell to cell. Do all nerve cells that express multiple synaptic α isoforms show variable expression levels, as ETCs do? In the present work, we provided another example, showing that MOB GCs have variable synaptic α2/α3 subunit ratios, with a correspondingly large variance in the τw of mIPSCs. However, our previous results in hippocampal pyramidal cells (PCs) indicate that this is not always the case. The axon initial segments (AISs) of PCs receive GABAergic input from axo-axonic cells (Klausberger and Somogyi, 2008), and it has been shown that these synapses contain both the α1 and the α2 subunits (Nusser et al., 1996; Fritschy et al., 1998). When we performed colocalization of these two subunits and compared the variability in the α1/α2 ratio between the AISs of different PCs, we did not find any noticeable difference. Thus, our data indicate that most hippocampal PCs use a similar α1/α2 subunit ratio in their AIS synapses, unlike ETCs and GCs of the MOB. Like hippocampal PCs, MOB ETCs, and GCs, the majority of neuron types in the CNS express multiple GABAAR α subunit isoforms in their synapses (Fritschy and Mohler, 1995; Pirker et al., 2000; Wisden et al., 2002). Therefore, it will be interesting to see whether they use a strategy similar to hippocampal PCs or to MOB ETCs with respect to the cell-to-cell variability of their synaptic GABAAR subtype ratio. It has been demonstrated that some nRT cells express the β1 subunit mRNA and that a fraction of their spontaneous IPSCs have larger peak amplitudes and faster decay kinetics (Huntsman and Huguenard, 2006). In our present work, we could not detect β1 subunit immunoreactivity in the nRT and did not find large amplitude, fast-decaying mIPSCs in any of our recorded and identified nRT cells. The lack of a subunit cannot be concluded from the lack of immunoreactivity, but the strong synaptic labeling of MOB mitral cells and hippocampal interneurons for the β1 subunit indicates that if β1 subunit is present in nRT cells, its density is very low. Our data are consistent with the differences in kinetics observed previously between α3 subunit-expressing nRT cells and adjacent α1 subunit-expressing thalamic relay cells (Browne et al., 2001; Mozrzymas et al., 2007). External tufted cells of the MOB have become the focus of much attention in recent years (Belluscio et al., 2002; Hayar et al., 2004a,b; Antal et al., 2006), leading to greater understanding of their intrinsic properties, synaptic connectivity, and functional role in odor processing. These cells receive GABAergic inputs from local interneurons, including PGCs, superficial short-axon cells, and GCs. Although it has not been demonstrated directly, it is very likely that a single ETC receives GABAergic input from multiple sources. For example, those ETCs that possess basal dendrites should receive innervation from both GCs and PGCs onto their basal and apical dendrites, respectively. The very small synapse-to-synapse variability in the α3/α1 subunit ratio within a given ETC indicates the lack of synaptic input-specific regulation of postsynaptic GABAAR subunit composition within individual ETCs. However, at the population level, the wide spectrum of IPSC kinetics present in different ETCs will allow them to play different roles in the trade-off between coding information for rapid, low threshold detection and the slower, integrative discrimination of odors. This work was supported by a Hungarian Academy of Sciences János Bolyai Scholarship (M.D.E. ); Wellcome Trust Project Grant 090197/Z/09/Z (Z.N. ); the Hungarian National Office for Research and Technology-French National Research Agency TéT Fund (NKTH-Neurogen; Z.N. ); a European Young Investigator Award (www.esf.org/euryi; Z.N. ); and Wellcome Trust Programme Grant 086185/Z/08/Z (M.F.). We thank these foundations for their support, and we thank Dóra Rónaszéki for her excellent technical assistance and Professors Jean-Marc Fritschy and Werner Sieghart for kindly providing GABAAR subunit-specific antibodies. (1993) Assembly of GABAA receptor subunits: α1β1 and α1β1γ2s subunits produce unique ion channels with dissimilar single-channel properties. J Neurosci 13:1429–1440. (2006) External tufted cells in the main olfactory bulb form two distinct subpopulations. Eur J Neurosci 24:1124–1136. (2007) Desensitization and binding properties determine distinct α1β2γ2 and α3β2γ2 GABA(A) receptor-channel kinetic behavior. Eur J Neurosci 25:2726–2740. (2002) Odorant receptors instruct functional circuitry in the mouse olfactory bulb. Nature 419:296–300. (2004) Analysis of the presence and abundance of GABAA receptors containing two different types of α subunits in murine brain using point-mutated α subunits. J Biol Chem 279:43654–43660. (2002) α1 and α6 subunits specify distinct desensitization, deactivation and neurosteroid modulation of GABAA receptors containing the δ subunit. Neuropharmacology 43:492–502. (2003) Effects of γ2S subunit incorporation on GABAA receptor macroscopic kinetics. Neuropharmacology 44:1003–1012. (2005) Tandem subunits effectively constrain GABAA receptor stoichiometry and recapitulate receptor kinetics but are insensitive to GABAA receptor-associated protein. J Neurosci 25:11219–11230. (2011) Profound desensitization by ambient GABA limits activation of δ-containing GABAA receptors during Spillover. J Neurosci 31:753–763. (2001) Kinetic and pharmacological properties of GABAA receptors in single thalamic neurons and GABAA subunit expression. J Neurophysiol 86:2312–2322. (2002) Intact sorting, targeting, and clustering of gamma-aminobutyric acid A receptor subtypes in hippocampal neurons in vitro. J Comp Neurol 443:43–55. (2002) Trace fear conditioning involves hippocampal α5 GABAA receptors. Proc Natl Acad Sci U S A 99:8980–8985. (1991) Immunoaffinity purification of GABAA receptor α-subunit iso-oligomers. J Biol Chem 266:24778–24784. 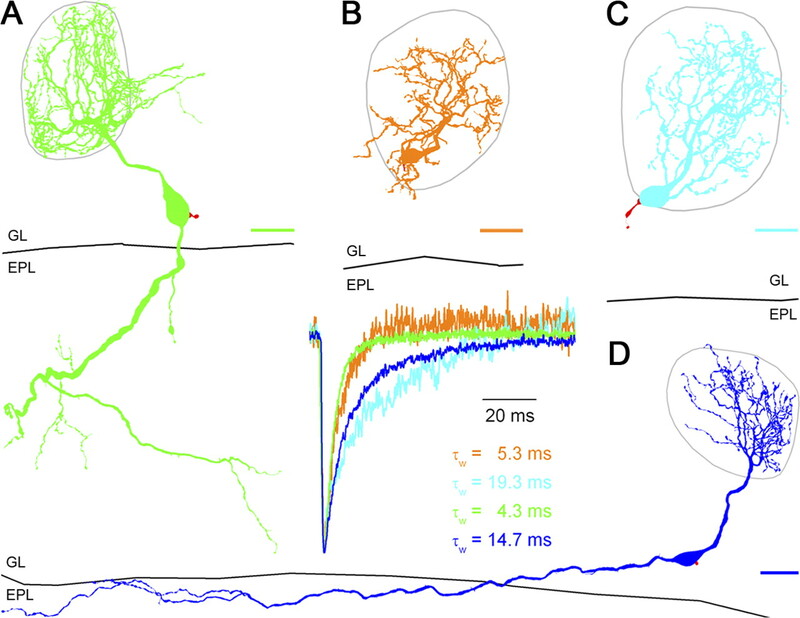 (2008) Distinct deep short-axon cell subtypes of the main olfactory bulb provide novel intrabulbar and extrabulbar GABAergic connections. J Neurosci 28:8217–8229. (2007) The cellular, molecular and ionic basis of GABA(A) receptor signalling. Prog Brain Res 160:59–87. (1995) GABAA-receptor heterogeneity in the adult rat brain: differential regional and cellular distribution of seven major subunits. J Comp Neurol 359:154–194. (1998) Synapse-specific localization of NMDA and GABAA receptor subunits revealed by antigen-retrieval immunohistochemistry. J Comp Neurol 390:194–210. (1995) Dependence of the GABAA receptor gating kinetics on the alpha-subunit isoform: implications for structure-function relations and synaptic transmission. J Physiol 489:529–543. (2000) Cell type- and synapse-specific variability in synaptic GABAA receptor occupancy. Eur J Neurosci 12:810–818. (2004a) Olfactory bulb glomeruli: external tufted cells intrinsically burst at theta frequency and are entrained by patterned olfactory input. J Neurosci 24:1190–1199. (2004b) External tufted cells: a major excitatory element that coordinates glomerular activity. J Neurosci 24:6676–6685. (2009) Intracellular chloride ions regulate the time course of GABA-mediated inhibitory synaptic transmission. J Neurosci 29:10416–10423. (2000) Nucleus-specific differences in GABAA-receptor-mediated inhibition are enhanced during thalamic development. J Neurophysiol 83:350–358. (2006) Fast IPSCs in rat thalamic reticular nucleus require the GABAA receptor beta1 subunit. J Physiol 572:459–475. (1997) Shaping of IPSCs by endogenous calcineurin activity. J Neurosci 17:7626–7633. (1997) Activation and deactivation rates of recombinant GABAA receptor channels are dependent on α-subunit isoform. Biophys J 73:2518–2526. (2010) Molecular identity of dendritic voltage-gated sodium channels. Science 328:906–909. (1994) GABAA receptor channels. Ann Rev Neurosci 17:569–602. (2009) New insights on the role of gephyrin in regulating both phasic and tonic GABAergic inhibition in rat hippocampal neurons in culture. Neuroscience 164:552–562. (2004) Positioning of the α-subunit isoforms confers a functional signature to gamma-aminobutyric acid type A receptors. Proc Natl Acad Sci U S A 101:7769–7774. (2003) Modulation of GABAA receptors by hydrogen ions reveals synaptic GABA transient and a crucial role of the desensitization process. J Neurosci 23:7981–7992. (2007) GABAergic currents in RT and VB thalamic nuclei follow kinetic pattern of α3- and α1-subunit-containing GABAA receptors. Eur J Neurosci 26:657–665. (2009) RNA editing of the GABA(A) receptor alpha3 subunit alters the functional properties of recombinant receptors. Neurosci Res 63:288–293. (1996) Differential synaptic localization of two major γ-aminobutyric acid type A receptor α subunits on hippocampal pyramidal cells. Proc Natl Acad Sci U S A 93:11939–11944. (1999) Differential regulation of synaptic GABAA receptors by cAMP-dependent protein kinase in mouse cerebellar and olfactory bulb neurones. J Physiol 521:421–435. (2001) Synapse-specific contribution of the variation of transmitter concentration to the decay of inhibitory postsynaptic currents. Biophys J 80:1251–1261. (2007) Editing modifies the GABAA receptor subunit α3. RNA 13:698–703. (2003) Synapse density regulates independence at unitary inhibitory synapses. J Neurosci 23:2618–2626. (2002) in Transmembrane transporters, Measuring and modeling the spatiotemporal profile of GABA at the synapse, ed Quick MW (Wiley-Liss Inc, Hoboken, NJ), pp 259–275. (2005) Heterogeneity of γ-aminobutyric acid type A receptors in mitral and tufted cells of the rat main olfactory bulb. J Comp Neurol 484:121–131. (2007) GABAergic phenotype of periglomerular cells in the rodent olfactory bulb. J Comp Neurol 502:990–1002. (2000) Altering the concentration of GABA in the synaptic cleft potentiates miniature IPSCs in rat occipital cortex. Eur J Neurosci 12:400–404. (2003) Declusterization of GABAA receptors affects the kinetic properties of GABAergic currents in cultured hippocampal neurons. J Biol Chem 278:16271–16279. (2007) Effect of the α subunit subtype on the macroscopic kinetic properties of recombinant GABAA receptors. Brain Res 1165:40–49. (1990) γ-Aminobutyric acid A receptor α5-subunit creates novel type II benzodiazepine receptor pharmacology. J Neurochem 54:1802–1804. (2006) GABA-based therapeutic approaches: GABAA receptor subtype functions. Curr Opin Pharmacol 6:18–23. (2000) Mini-review: gephyrin, a major postsynaptic protein of GABAergic synapses. Eur J Neurosci 12:2205–2210. (2006) Immunofluorescence in brain sections: simultaneous detection of presynaptic and postsynaptic proteins in identified neurons. Nat Protoc 1:1887–1897. (2006) Structure, pharmacology, and function of GABAA receptor subtypes. Adv Pharmacol 54:231–263. (1996) Distinct deactivation and desensitization kinetics of recombinant GABAA receptors. Neuropharmacology 35:1375–1382. (1990) Functional properties of recombinant rat GABAA receptors depend upon subunit composition. Neuron 4:919–928. (1999) New perspectives in the functional role of GABAA channel heterogeneity. Mol Neurobiol 19:97–110. (2008) Synaptogenesis in the cerebellar cortex: differential regulation of gephyrin and GABAA receptors at somatic and dendritic synapses of Purkinje cells. J Comp Neurol 508:579–591. (2003) Perisynaptic localization of δ subunit-containing GABAA receptors and their activation by GABA spillover in the mouse dentate gyrus. J Neurosci 23:10650–10661. (1998) The dynamics of synchronized neurotransmitter release determined from compound spontaneous IPSCs in rat dentate granule neurones in vitro. J Physiol 510:477–497. (2002) Ectopic expression of the GABAA receptor α6 subunit in hippocampal pyramidal neurons produces extrasynaptic receptors and an increased tonic inhibition. Neuropharmacology 43:530–549. (1997) GABAA receptor-mediated Cl− currents in rat thalamic reticular and relay neurons. J Neurophysiol 78:2280–2286.